What were you doing in your spare time when you were 16? You were probably focused on going out with your friends or stalking your campus crush. In the case of today’s teens, many spend their time constantly posting updates on Twitter and Facebook, taking selfies or texting. At 16, twin sisters Gabriella and Giovanna Thohir are championing biodiversity in their own simple way. 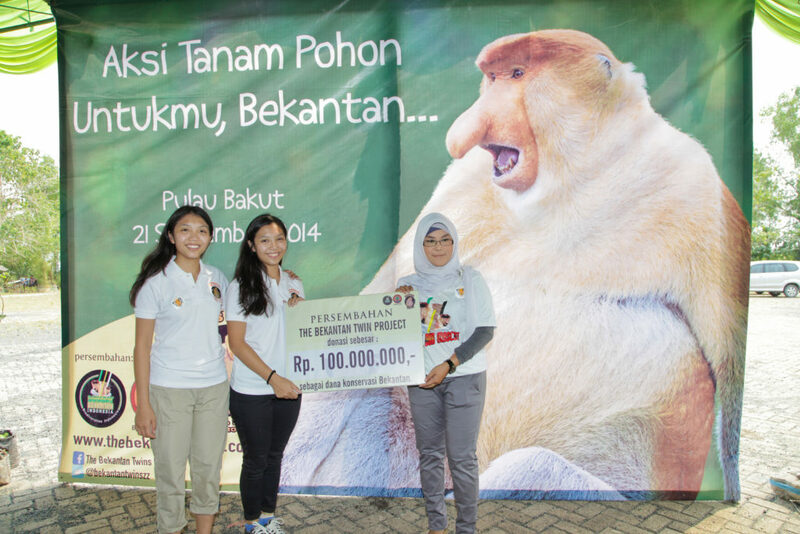 They are inspiring their fellow youth and the public in Indonesia to conserve the endangered bekantan. Known as the proboscis monkey (Nasalis larvatus), the bekantan is popular for its unusual appearance. The mature males have large pendulous noses that hang over their mouths. The bekantan is endemic to the island of Borneo in Southeast Asia. Unfortunately, their natural habitats are continuously threatened by the clearing of the regions’ rainforests for timber, settlements, and oil palm plantations. Such acts force these omnivores to come down from trees more frequently and travel longer distances in search of food. This puts them at a larger risk of being eaten by land predators such as alligators and native people who consider proboscis monkeys a delicacy. The species is classified as endangered under the International Union for Conservation of Nature’s (IUCN) Red List as it has undergone extensive population reductions across its range. Ongoing hunting and habitat destruction continue to threaten their population. Numbers have declined by more than 50 percent (but probably less than 80 percent) over the past three generations covering approximately 36 to 40 years. After knowing about the sorry state of the bekantan, Gabriella and Giovanna, also known as Gabby and Ghea, had a bright idea – launch a campaign to save the bekantan. “Proboscis monkeys are a symbol of our culture. It is a unique animal that is endemic to our country. 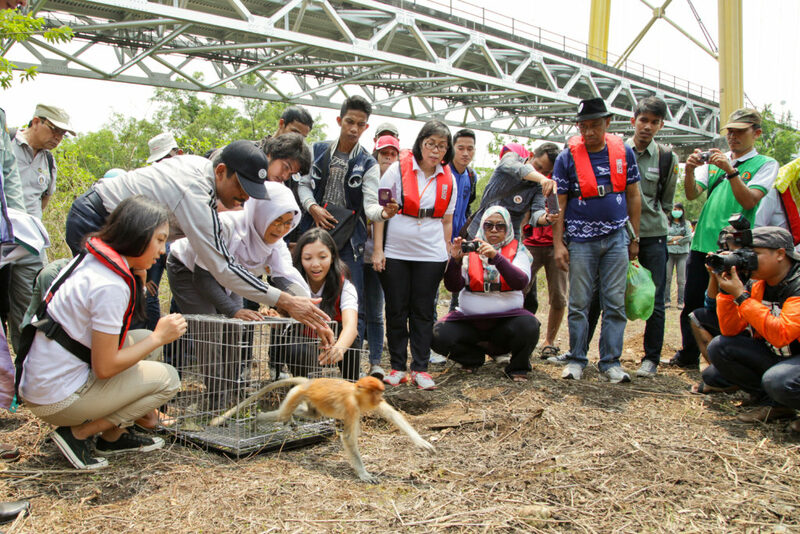 Although they are as unique as orangutans and komodo, which have had a lot of media coverage, these poor creatures are left to survive on their own, while we tend to the necessities of our lives. Why are they important? Why should we help animals when we can’t even take care of ourselves? Why? Because in the future, when we do get our lives sorted out, we will not be able to see any of them. We have lost many species already to the actions of mankind. Should we sacrifice another to suit our needs? It doesn’t take much to help. The first step is awareness,” Gabby and Ghea said in an article they wrote. They thought of using technology to promote the conservation of these creatures. They created the website www.thebekantantwins.com in 2013 to generate awareness about the bekantan. Apart from uploading key information on the bekantan, the twins also document their activities and share them with their audience in hopes of inspiring them. The website is also used as a platform to sell merchandise such as bekantan stuffed toys to raise funds for the bekantan conservation program. To jumpstart their campaign, the twins journeyed to experience the bekantan. They visited the Kaget Island in South Kalimantan to see the bekantan in their natural environment. The trip further strengthened their resolve to save the bekantan. To ensure the project’s sustainability, the twins knew they need to work with experts and other like-minded groups. They approached Professor Dr. Ir. H. M. Arief Soendjoto, M.Sc. from the Forestry Faculty of Lambung Mangkurat University to guide them on the project. “The act of these two extraordinary girls is truly inspiring. The numbers of bekantans have continuously declined over the years and has become a critical concern. As an academic professional, The Bekantan Twins Project gave us a big help. It’s such a blessing to see young people taking part in preserving our endangered species. I have taken part in guiding Gabby and Ghea throughout the project for I want to do everything I possibly can to help these girls in achieving the success their efforts deserve. From taking them around Bakut Island to providing research information on bekantan, it has been truly an honor to be a part of this movement,” Prof. Soendjoto said. The team approached the Indonesian Natural Resources Conservation Office, the administrator of Bekantan conservation area, Bakut Island, an island located in Banjarmasin, South Kalimantan. The team presented a grand design in building Bakut Island as a pilot project for the Indonesian Natural Resources Conservation Office. The Bakut Island Project is envisioned to be completely built and well-managed as a structured rehabilitation and tourism area in a few years’ time. Aside from building strong networks to ensure the project’s sustainability, the twins are conceptualizing more creative conservation programs using charity funds collected for this project. 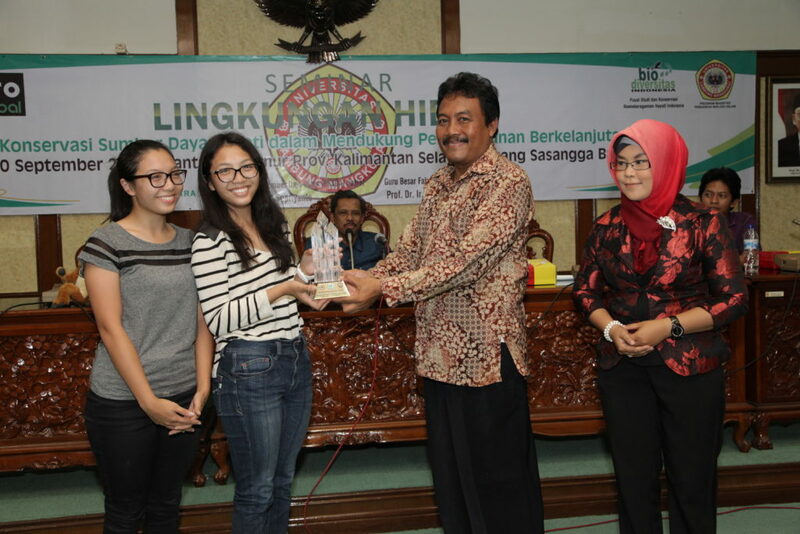 Zulfikli Hasan, S.E., M.M., Minister of Forestry, Indonesia, expressed appreciation to the twins for taking the lead in saving the bekantan and expressed support for the project. “They have chosen a very good strategy by focusing on awareness creation among youth and engaging partners to ensure the sustainability of the project. I know their fight has just started.” He highlighted the importance of supporting the project. To reach out to their fellow youth, the twins organized an awareness raising event at the Mall Kota Kasablanka in Jakarta. Participants were volunteers from Global Jaya International School, Mentari International School, Universitas Indonesia, and Institut Teknologi Bandung. Merchandise sales and donations reached 50 million Rupiah. While the project is young and needs further support to grow, the twins and their partners are happy to have made the initial step towards saving the bekantan. “A journey of a thousand miles starts with a single step,” they said.